Bringing education and opportunity is a community effort! We want you to be a part of it and share in this beautiful experience. ​DESIGNATION (optional) - To designate your donation for a specific fund or purpose, please specify on the MEMO portion of your check. DEDICATION (optional) - To make a donation on behalf of or in memory of another person, please let us know. VIDES relies entirely on donations from its administration, generous donors and sponsors. We appreciate all forms of donation, whether it is a one-time gift, a monthly donation or sponsorship of a project or volunteer. Through your contribution and prayers you continue to bring joy and hope to the young and to women in need. God bless you! Greetings and thank you! Your contribution can truly have a ripple effect which goes far and wide. It can touch and change the lives of the children, their families and community, of the volunteers and the care-givers. With your support, projects to improve the lives of women and children in vulnerable situations can become possible. This has an impact on the entire community's ability to take care of itself. Families benefit as well, through programs that provide training for parents so that they can better support themselves. Nearly half of the world's population must survive on less than $2 a day - 98% of which live in developing countries. A little less than half of that population survives on less than $1 a day. In dire situations such as this, education, shelter, and clothing become luxuries where they should be rights. 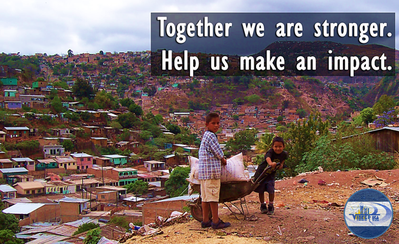 Help us be an advocate for the marginalized in the world! Please pray for the people we serve, for our Mission Projects, and for our volunteers. If you are able to make a donation, we’ll be most grateful to you. Thanks and God bless you!